Cookie Magazine is an upscale publication devoted to new mothers and their families, focusing on modern parenting, cool products and interesting vacation and entertaining tips. Products for the home are also featured, and what could be more cool in the home than custom wallpaper? of the modern dream home, you know custom wallpaper was going to come into play. 212 Box Architecture, who has been using our custom wallpaper for some time, brought us on board to print the custom wallpaper design they created. 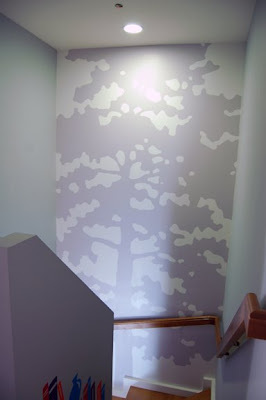 Their design, a graphic, simplified gray tree over a simple white background, was installed in a stairway of the showcase home. Clearly a tricky place to decorate substantially, the finished stairwell is anything but conventional. The custom wallpaper installation is visually bold yet unobtrusive due to the muted color palate. The greatest aspect of custom wallpaper is it's sheer versatility and the innumerable applications that it's perfect for. From adding punch to a high-end modern living room to addressing a ho-hum stairwell, custom wallpaper gives you complete freedom to make your walls as unique as you. Check out more info about the Cookie home here, and visit Cookie Magazine online. Visit http://www.greatwallonline.com to start your project today!